Mysuru: Lakhs of people have heard Prime Minister Narendra Modi at the Maharaja’s College Grounds on Feb. 19 where he addressed a public rally in a poll-bound State and thousands would have read or watched in the print and visual media about Modi flagging off the ‘Palace Queen Hamsafar Express’ connecting Mysuru and Udaipur and the commissioning of the rail electrification project between Mysuru and Bengaluru. 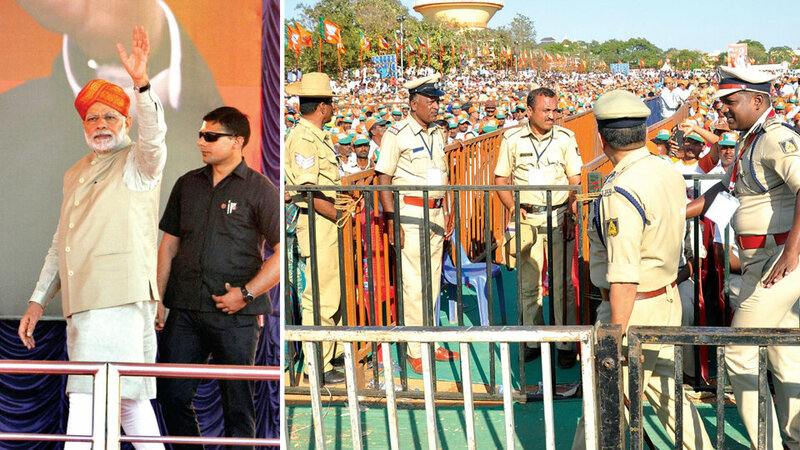 What many people do not know is that the entire Police and the Administrative machinery worked behind the scenes to ensure that the PM is well-protected and his public functions in Mysuru are incident-free. Arrangements started as soon as it was communicated to the District Authorities that Modi will arrive in city on the night of Feb. 18 and has a packed schedule till the evening of Feb. 19. Amidst his tight schedule, Modi was also scheduled to visit Jain pilgrimage centre of Shravanabelagola to participate in the 88th Mahamastakabhisheka. Considering the threat to Modi’s life from internal and external terror forces, he always moves with a thick ‘Z Plus’ security blanket around him. While the Special Protection Group (SPG) form the core security group, Commandos from the National Security Group (NSG) form the outer layer. The local Police (wherever the PM visits) form the boundary-line security. In fact, the point-to-point detailed security planned and executed by the Mysuru Police, City Police, the SPG and the NSG has come in for widespread praises as the PM’s visit went on smoothly. From the time the PM’s special plane landed at the Mysore Airport in Mandakalli till his departure, the district machinery was on its toes to ensure order and security. The challenge now is that the PM might make a couple of trips again to Mysuru as Karnataka is headed for elections in a couple of months. Speaking about the behind-the-scene security activities, City Police Commissioner Dr. A. Subrahmanyeswara Rao told Star of Mysore that guarding and managing PM’s cavalcade as it moved from one place to another in the Central Business District was a tough challenge. “The PM’s road trips along with his high-security vehicles — from Mysore Airport to Hotel Radisson Blu on M.G. Road where he stayed on Feb. 18 to Lalitha Mahal Helipad on Feb. 19 when his chopper flew to Shravanabelagola, from Maharaja’s Cricket Grounds to City Railway Station and from there to Maharaja’s College Grounds — were extremely challenging,” he said. “Fortunately, the PM’s SPG decided that his chopper will land at Mysore Airport after the public rally at Maharaja’s College Grounds. It would have been tough for us if the SPG had decided that the PM’s convoy will reach the Airport by road,” Dr. Rao added. Mysuru’s roads and footpaths are wide enough and thankfully there was no untoward incident and the people cooperated too. “There were many uncertainties in the PM’s programme schedule and the entire time management was taken over by the SPG. The issue of his stay — Radisson Blu and Infosys Campus as Hotel Lalitha Mahal Palace was fully booked for a wedding ceremony in advance — was also confusing as there were no details till the last moment. We had to arrange for security at two places,” the city top cop said. More than 3,000 Policemen were deployed exclusively for PM’s security including Mysuru Superintendent of Police (SP) and four SP-ranking officials, 12 ACP-ranked officials and over 1,000 Policemen drawn from other districts, he added. “Though the PM stayed at Radisson Blu, based on the directives from the SPG, we had set up ‘Safe Houses’ at Vice-Chancellor’s Office at Crawford Hall, Administrative Training Institute Director’s Office and Divisional Railway Manager’s Office. We had also set up communication networks and hotline facilities from these Safe Houses,” he said. Mentioning that it was for the first time he managed PM’s security, Dr. Rao said that when he was a probationary IPS officer at Belagavi, he had seen the way how the then Belagavi SP Sunil Agarwal (he was the Mysuru City Police Commissioner too) had managed the security of the then Prime Minister Atal Bihari Vajpayee. He added that he would give a certificate of appreciation to all the Police officers and Policemen who have participated in PM’s security operations. Too much tax payer’s money is spent on this. Was it needed? Can’t the PM inaugurate all this from Delhi by video conferencing? Just to make a public speech, he came to Mysore. Oh, he needed to come to Shravanabelagola.. Now it makes sense, but still expensive trip.